The pressure is bound to be on when you're the Champions League’s youngest ever goalie. The 18-year-old caught Marcus Rashford's free kick - but lost his balance. No doubt he'll be cringing when he relives the moment when he carried the ball over the line - giving United a sneaky win. 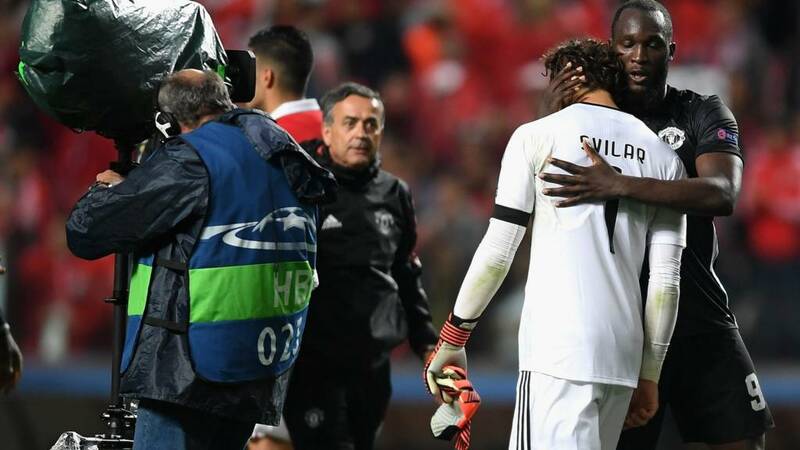 All joking aside, he was visibly upset at his error, so Lukaku showed great sportsmanship by consoling the teenager at full-time. App users may need to click the link to view the Tweet. Gordon Hayward played his first game for the Boston Celtics last night and today's he's on everyone's lips... although unfortunately for the wrong reasons. Hayward was justfive minutes into the game when he collided with Cleveland Cavaliers’ LeBron James and broke his ankle.Get well soon, Gordon! The 27-year-old joined the Celtics from Utah Jazz in July in a deal worth $128m (£97m). After the horrific injury, social media was filled with ‘Pray for Hayward’ tweets, and the rivalry between the two teams stopped as the players came to terms with what happened. This tweet pretty much sums up how we’re all feeling today. Wishing you a speedy recovery, Gordon! What makes a good goalie? Petr Cech was put through his paces this morning - ping pong style. The Arsenal goalkeeper shared a video on Instagram of the quirky workout that definitely tested his reflexes. A machine fired out ping pong balls which the keeper had to catch - but there's a twist. He also had to touch different coloured cones between catches. Just look at the concentation on his face! App users may need to click the link to view the Instagram post. Cristiano Ronaldo was spotted singing along to the Champions League music and suddenly we feel like he's our best mate. It's a great feeling when the you hear that spine-tingling music before the start of a game. And it's good to know one of the best players in the world can't resist a good sing-song. Cameras caught the Real Madrid star sneakily singing along to the words ahead of Tuesday's 1-1 draw with Tottenham. Suddenly, it makes us feel a bit better about tearing up every time we hear that special song. App users may need to click the link to view the Instagram post. One Coventry City fan wasn't best pleased with his team's performance last night. We've all been there, yelling at the left-back from the stands before firing out a stream-of-conscious rant to your Twitter followers on the way home. Not this guy. He took things a little too far, storming onto the pitch and giving the players a piece of his mind. Lifelong fan Darren Kedzierski has followed the Sky Blues for over four decades. But last night, he decided enough was enough when the West Midlands side lost 1-0 at home to struggling Forest Green Rovers. The father-of-three admitted he told the players he was "fed up of watching this rubbish and that no-one is putting in any effort". "It was the only way I could vent my frustrations. I know it’s not right but what other options have I got?” Kedzierski added. Manchester City star Gabriel Jesus celebrated scoring a goal by performing his version of the grime song 'Man's Not Hot'. You've probably heard it, or at least seen memes about it on Twitter. It's a song by comedian Michael Dapaah - better know as Big Shaq, who became an overnight sensation after dropping the song on Radio 1 Xtra DJ Charlie Sloth's Fire in the Booth. The lyrics go something like: "The ting goes skraaaah, pap pap ka-ka-ka." So the 20-year-old forward thought he'd give it a go by singing along to the tune following last night's Champions League win over Napoli. What do you think of his efforts? LeBron James boasts a huge trainer collection and last night he used his kicks to make a strong statement. The basketball legend chose the first night of the new NBA season to get a powerful message across by wearing black shoes with the word 'equality' stitched in gold across the heels. The shoes were part of a Nike range released in February to commemorate Black History Month. James' Instagram post has led many to speculate the shoes are showing solidarity with the current NFL protests, which aim to shine the spotlight on police brutality and racial injustice. He captioned the post: "Together we will persevere through all adversity, negativity and turn it into happiness and love!" Whatever the reason behind the fashion choice, it's a great way to stand up for something he believes in.